Give a man a gun, and he can rob a bank. Give a man a bank, and he can rob a country. Those are the very true words that two weeks ago had a man in Pennsylvania arrested. His purported crime? 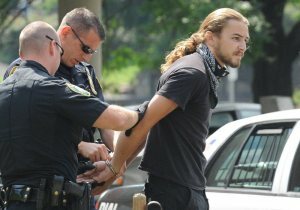 Terroristic threats, and the attempted robbery of the bank he was protesting! Welcome to the new America — where banks must be protected at all costs. Whether it’s a bailout or a trumped up charge to silence a protestor, if the banks want it, they get it. The district attorney in the case has dropped the charge of attempted robbery. However, a terroristic threat charge remains. Meanwhile, the economic evidence is mounting that countries that want to recover need to tell the banks to take a hike. What Iceland’s recovery demonstrated was the case for letting creditors of private banks gone wild eat the losses. Krugman, it seems — after years of defending bank bailouts — is learning. But what hope is there of telling the banks to take a hike when law enforcement, politicians and courts will gladly arrest, charge and try an anti-bank protestor exercising their constitutional right to free speech? Law enforcement, politicians and courts have it upside down. It isn’t banks that need protection from protestors. It’s citizens that need protection from the banks. This entry was posted in Current Affairs, Finance, Wall Street and tagged dave gorczynski, jp morgan, new america, new ipad, wells fargo. Bookmark the permalink. I read that over the last month there have been some 30+ arrest of this sort.The clamp down has begun !!!!! off to a FEMA we camp we all go!! I’m like most people, I don’t believe in bull _ _ _ _ but I know the mayan people was experts at calculating time and calculating cycles, It makes me wounder if what they calculated was world war. Did Krugman change his article? I went to read it at the link, and I couldn’t find your quote. please sign and support this petition if you agree. I’m trying to find updates on the story to post as well. thanks.